Balram Halwai alias Munna is a driver – sarcastic, humorous, critical, angry, and a wealth of information on modern-day India. He becomes a wanted man after murdering is master. At no point as a reader was I sympathetic towards Balram. I believe this was done on purpose. In spite of everything, Balram does weave interesting tales, which keep you reading to the end. 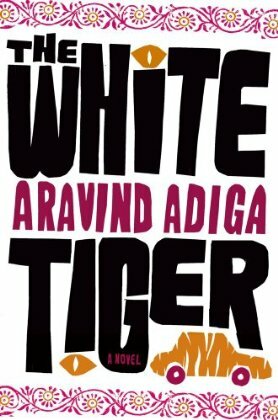 The White Tiger is an in your face gritty, realistic novel revolving around the tragic life of Balram Halwai and particularly the harsh, slavish life in India. Weak stomachs abstain. The White Tiger is full of audacious, enticing, and repulsive smells. One’s imagination is heightened to the max. India is painted as a place riddled with poverty, violence. corruption, and contradictions; although universally speaking I think most countries are contradictory and contain degrees of these things. Reading The White Tiger is like having your face shoved in wet, gooey mud and then having to clean it with a kleenex. It sticks to you like a second skin. Some may find it an ongoing complaint of 276 pages and will say it’s one big bore, but I felt I was being instructed about what it is to be an Indian trying to maneuver through this unkind, violent, corrupt and unforgiving place. The book carries a lot of themes throughout such as socialism vs. capitalism, family ties, master servant relationships, life in developing countries and its economic effect on their citizens etc. I guess if I analyzed from an academic point of view you’d have the three conflicts: man against man, man against nature, and man against himself. I can’t decide which theme is the strongest. Aravind Adiga’s main desire was to write a book that would entertain readers, not necessarily to make some political statement. The novel is absolutely brilliant! It’s a must read. I understand why Adiga won the 2008 Man Booker Prize. The White Tiger was so well constructed that I really believe it is a work of art. On the front cover is written, “One of the most powerful books I’ve read in decades. No hyperbole. This debut novel hit me like a kick to the head — the same effect Richard Wright’s Native Son and Ralph Ellison’s Invisible Man had.” – USA Today. When Adiga was asked who were his literary influences he cited Ralph Ellison, James Baldwin, and Richard Wright. This is very clear while reading. They are some of my favorite writers too. Their novels contain such power and harsh reality that almost makes you feel slightly voyeuristic, but mostly enlightened. I bought this book a year and a half ago because I had read quite a few articles on this prize-winning novel and it sat on the shelf unfortunately until now. Wish I would have read it sooner, but I’m delighted that I finally got around to this five-star wonder! Aravind Adiga and his family emigrated to Australia where he continued studying in high school. He later studied English Literature at Oxford and Columbia Universities. He went on to a successful career as a financial journalist having written articles for the Financial Times and Money. Subsequently, he worked for Time magazine and went on to write The White Tiger while he was on freelance. In 2008, Adiga joined the prestigious group of Indian born writers, Salmon Rushdie, Arundhati Roy, Kiran Desai in winning the Man Booker Prize. Another one staring at me from the shelf, thank you for a great review, I’m tempted to read this soon. And you should. I could kick myself for not having read it sooner. It’s fabulous! I read it in 3 days, just couldn’t put it down. Teaching made me put it down, but nothing else. Happy reading…. Your best review yet–So compelling! The author is lucky to have you review this book. I’m going to read asap. Thanks! Yes I agree – that was an excellent review Deidre! I didn’t make it to the book club on Saturday which I regret as I’d have loved to hear what the others said. It is an incredibly powerful book, I found it excellent – and I started off with negative feelings!! The author writes about abject poverty and absolutely horrendous situations but in such a no-nonesense, non-sentimental manner and always laced with irony, enabling the reader to step back a little from the terrible reality of the situation. But I must admit to still having qualms about going to India to see all that first-hand. Yes I agree. India seems to be a fascinating place but actually visiting. I don’t think I’m ready yet. I hope to be one day because I think it’s a place that would be filled with adventure. Well, I guess I will pick this one up on my next trip to the bookstore, your review makes me want to read this one and soon. Thanks D.
It’s brilliantly written!! A must read!